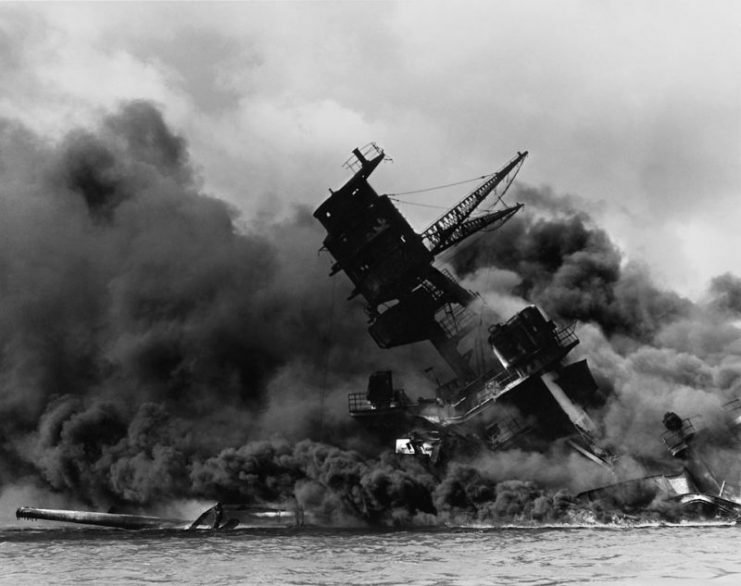 It was November 21, 1943. 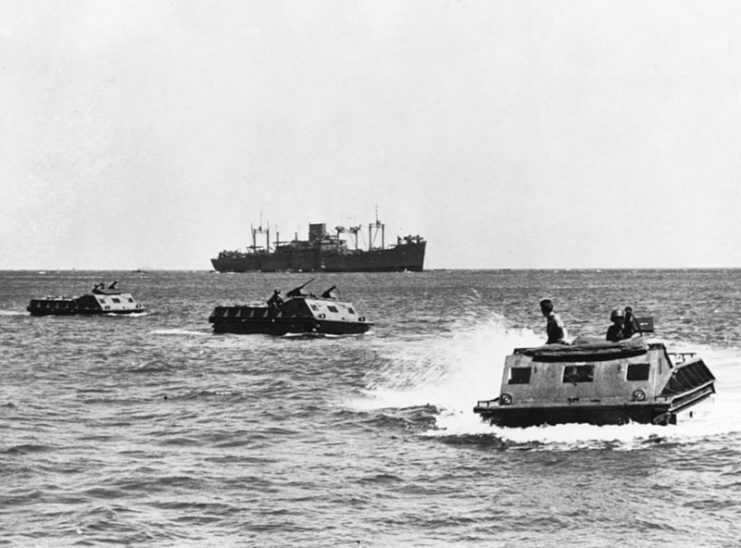 Three dozen transport ships were sailing toward the small island of Betio in Southern Tarawa. Inside were men of the 2nd Marine Division, as tough as can be. 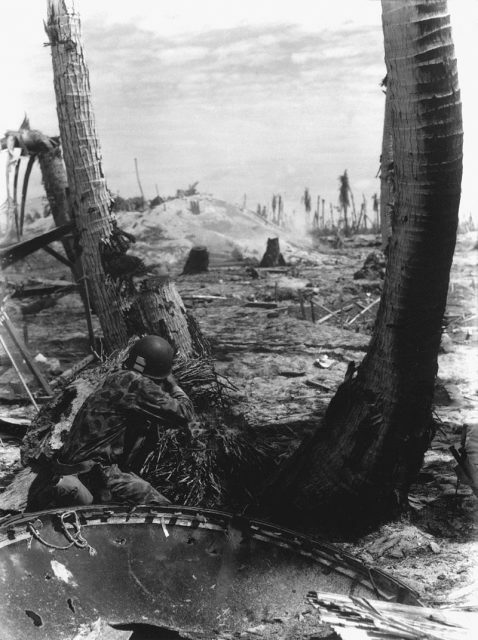 They were going straight into the Battle of Tarawa, facing a fortress of Japanese bunkers and machine guns. In four days of battle, they showed what they were made of. Made of blood and sweat and of men like First Lieutenant William “Hawk” Hawkins. There is a belief that one will die only when his time comes, and not a minute before. Such was the case with Hawkins. 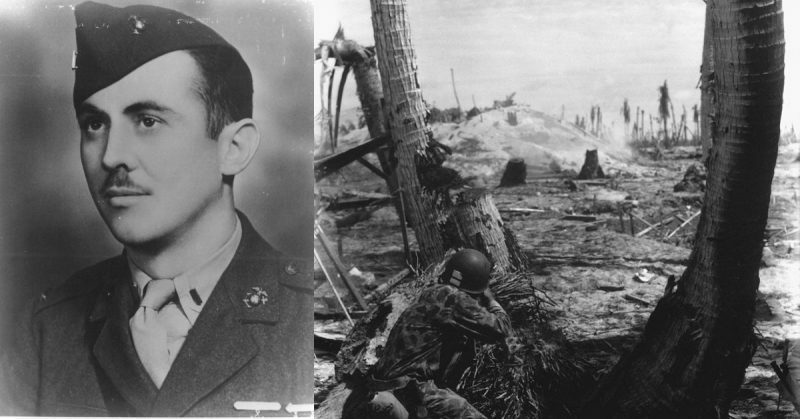 He was destined to live until Tarawa, even though he barely survived serious injuries when he was only three years old. At that time, he was running and bumped into a neighbor, who spilled boiling water on him. He suffered severe burns on more than a third of his body. His limbs were burned the worst. Since he wasn’t able to straighten his arm and leg, doctors decided to cut the muscles. Luckily for young William, his mother refused the operation. Determined not to give up on her son, for an entire year she massaged his leg and arm for several hours each day. William’s muscles eventually recovered, and he was able to walk again. Tragedies put no constraints on William, not even his father’s death when William was 8. It only made him a fighter. He was among the best students in his high school, graduating at the age of 16. His scars were always there to remain him that he should never give up. It was because of his old injuries that he was rejected both by the Navy and Army Air Forces for the job that was his childhood dream. Interestingly, William Hawkins was a great opponent of the war. He hated it and saw no reason why his country should get into it. However, after the Japanese attack on Pearl Harbor, his story turned in quite a different direction. He felt it was his duty to help his country when it was attacked. After spending Christmas at home, he decided to try his luck with the Marines. It seemed that the toughest of them all had no issues with his scars, so on January 5, 1942 Hawkins joined the 7th Recruit Battalion at the Marine Corps Recruit Depot in San Diego. It made him very proud. 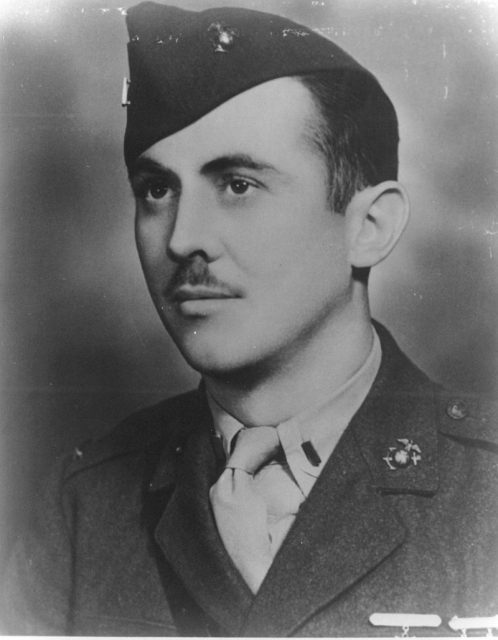 Once a Marine, Hawkins was sent to the 2nd Marine Battalion of the 2nd Marine Division. There he completed Scout Sniper School. Rigorous training in the school transformed a resolute young man into a fighting machine. With the rest of the division, Private First Class Hawkins deployed to the Pacific Theater on July 1, 1942. While still on board the USS Crescent City he was promoted to corporal, and then to sergeant once the division set foot on Tulagi. It was during the Battle of Guadalcanal that “Hawk,” as his fellow Marines begun to call him, showed that he was not only a Marine from head to toe, but also a natural leader. His Marines claimed that they would follow him everywhere. That was why he was commissioned as a second lieutenant on November 17, 1942. On June 1, 1943 he was promoted to first lieutenant and put in charge of the Scout and Sniper Platoon. 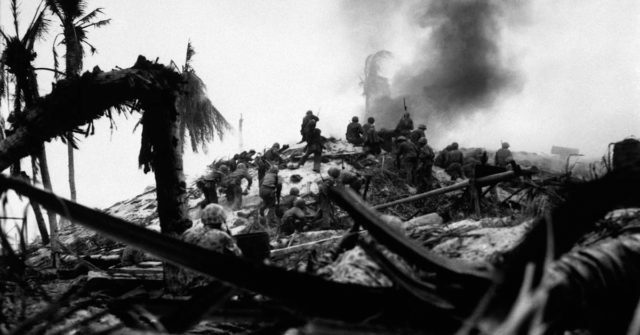 Tarawa Atoll was the Marines’ next destination as they leapfrogged across the Pacific. With its well-prepared defenses, it proved to be the greatest challenge for the Americans thus far. 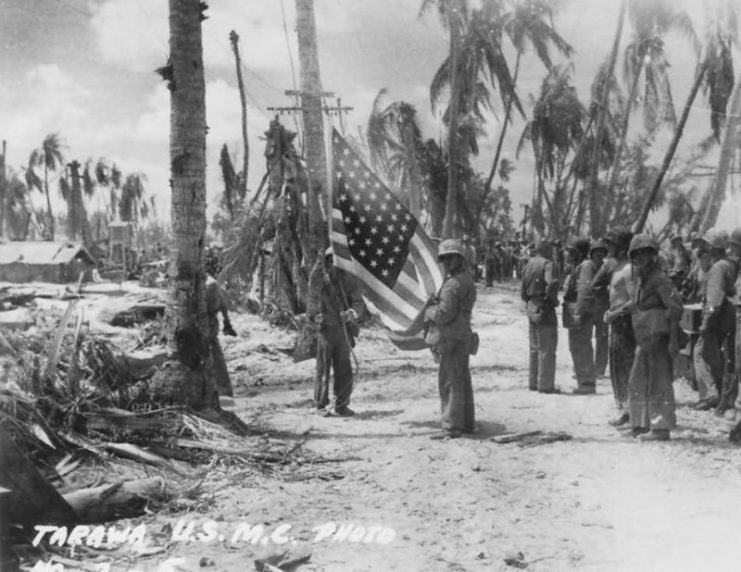 In just three days, Tarawa’s casualty toll was the same as the entire campaign at Guadalcanal. 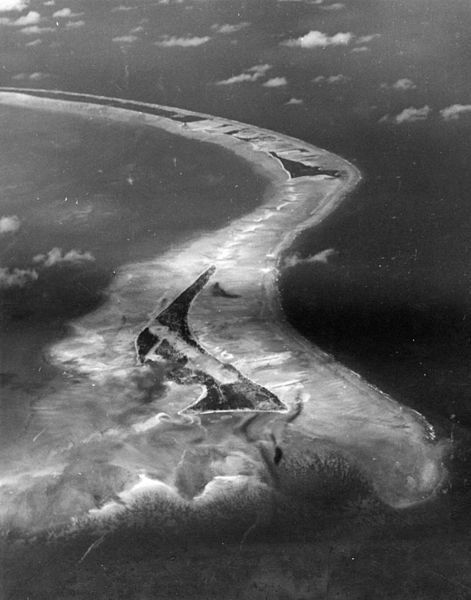 The small island of Betio to the southwest was the key point of Tarawa’s defense. It was only two miles long and half a mile wide at its widest point, but it was fortified with a network of steel and concrete pillboxes connected by tunnels and housing more than 100 machine guns. 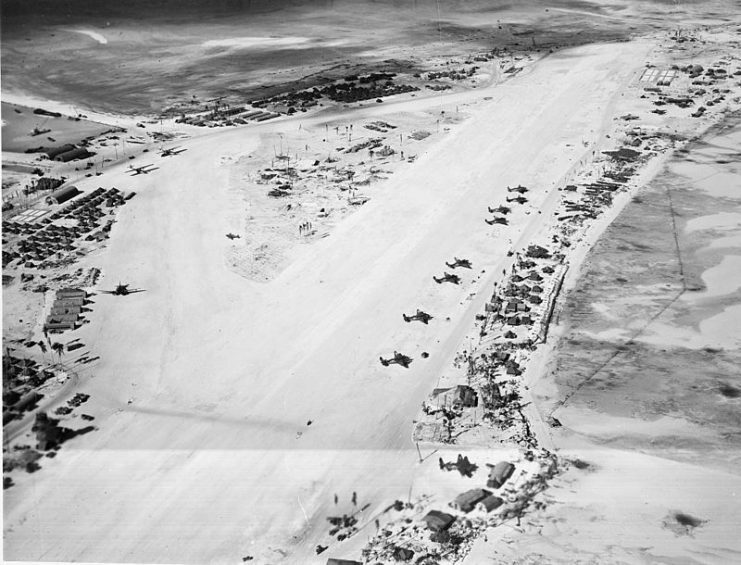 Tarawa Atoll aerial photo Sept 1943. With their well-positioned weapons, Japanese soldiers were able to rain fire on an enemy advancing from any direction. There were also concrete obstacles and seawalls to prevent the advance of both men and vehicles. The Japanese commander believed that a million soldiers could not conquer the island in a hundred years. Long range aircraft at Hawkins Field on Betio (Tarawa Atoll) March 1944. 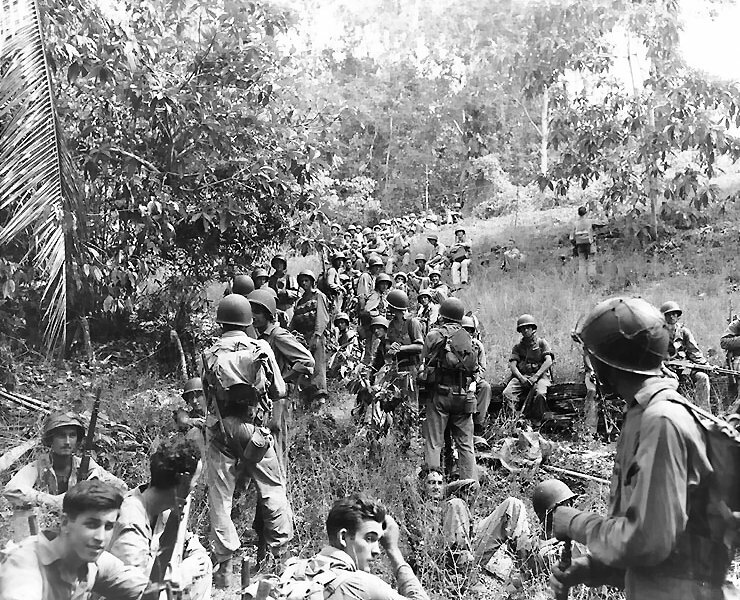 It was there that the 2nd Marine Division was ordered to land. Hawk’s platoon had to secure the pier and the first line of Japanese defenses before the arrival of the other invasion troops. As the transport ships approached the landing zone, everyone aboard was silent, thinking about the strength of the Japanese defense. Everyone except Hawk, who was eager to meet them. The plan was that he and his platoon would land on the island fifteen minutes before the main wave of troops. Their task was to clear the long landing pier of machine gun nests. With no hesitation, Hawk’s group attacked the first obstacle–two wooden houses–with flamethrowers. In a matter of minutes, the entire pier had cleared of enemies, destroyed before they even knew what struck them. Hawk and his men then returned to their boats and landed on the shore of the cove, where Japanese machine guns were firing against incoming Marines. The rest of the Marines were approaching in waves, riding in LVT 4 Alligator Amtrac vehicles. Those who managed to reach the shore were doing their best to reach the seawall in order to gain cover from Japanese machine guns. A Marine fires on a Japanese pillbox. Stopped at the Beach Barricade. 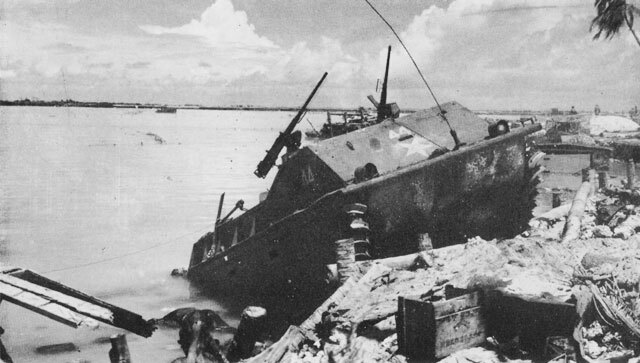 Japanese defenders knocked out this LVT on Beach RED 1. On the following day, as the Marines started to advance through the island, they got stalled by several pyramid-shaped steel pillboxes. Again, Hawkins and his platoon continued to amaze others with their bravery. At one point Hawk was standing on top of a moving Amtrac, shooting enemy soldiers while bullets were flying past his head. He acted in such a way that no one believed he would survive the day. 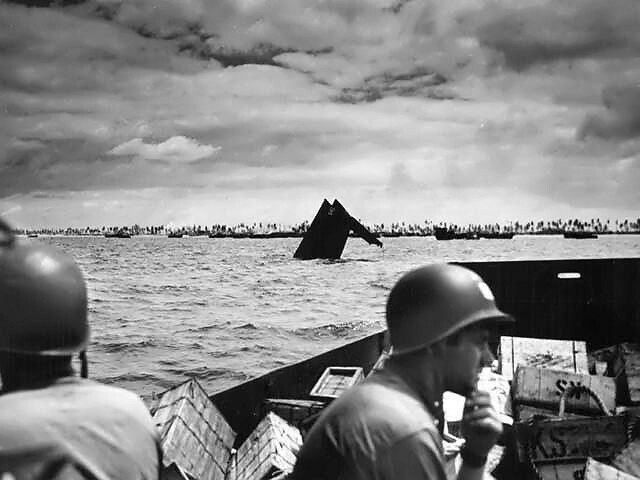 U.S. Coast Guardsmen ferrying supplies pass an LCM-3 which has taken a direct hit at Tarawa. And he didn’t! That day Hawk died in the manner of greatest warriors. His death occurred after he alone charged eight Japanese pillboxes. He destroyed the first six by crawling up to them under a hail of bullets from machine guns. Once he reached them, he fired at the Japanese soldiers inside at point blank range. 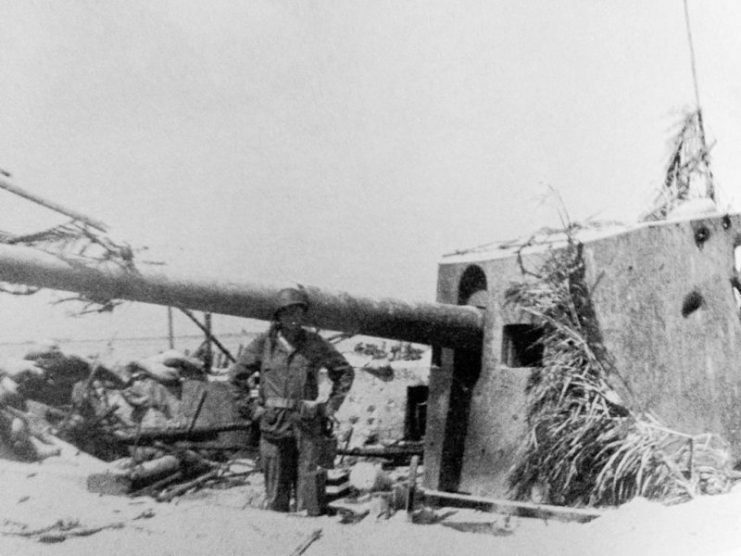 With no ammunition left, he charged the seventh pillbox and threw grenades at it. He managed to destroy it, but he also got hit in his shoulder. 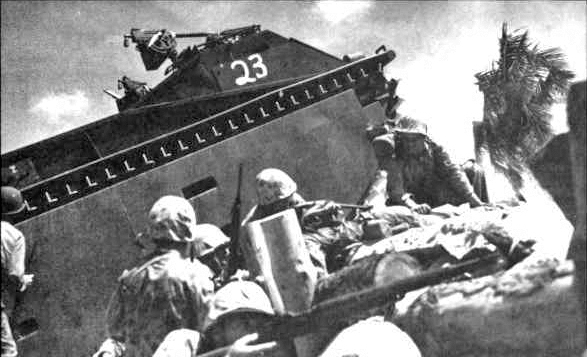 LVT-1 move toward the beach on Guadalcanal. The USS President Hayes (AP-39) is seen in the background. When Hawk charged the eighth pillbox, he got hit again and this time the wound was lethal. His men believed that he would survive, but he lost too much blood and died that evening. After the battle was over on November 23, his entire platoon and all the other Marines on the island were grieving for him. Because of his remarkable bravery, everyone from privates to senior officers had enormous respect for him. So much so, that just a few days after Hawk’s death the airstrip on Betio was named after him. 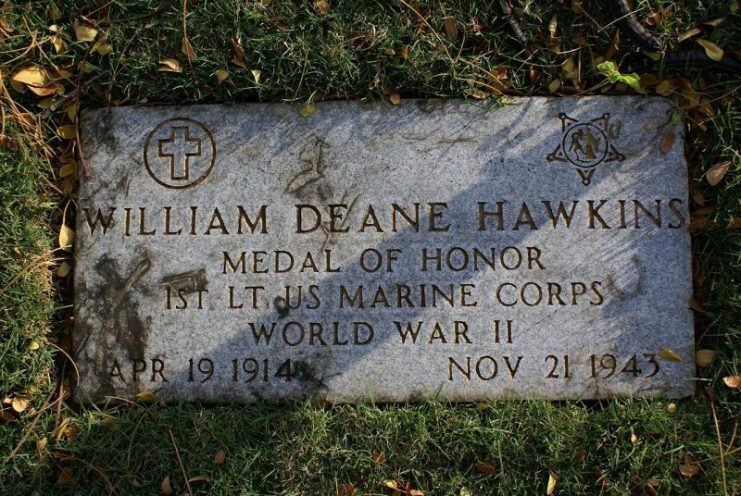 For his acts of bravery, William D. Hawkins was posthumously awarded with the United States’ most prestigious military decoration, the Medal of Honor. He was a true example of the core values of the Marines.